IT IS always lovely to receive feedback from members of the public through our Hotline 5441 6200. Other stories are emailed with photos of our unique wildlife. 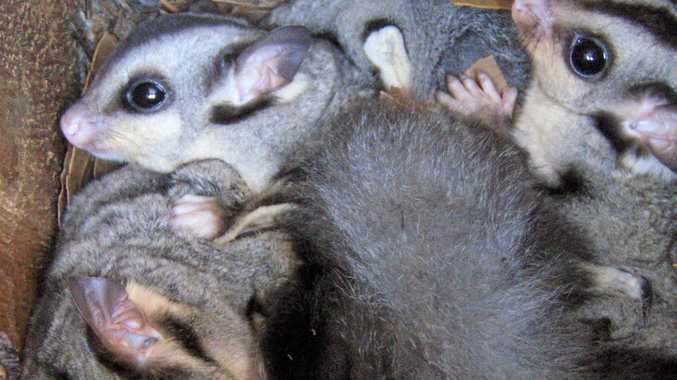 Recently, Mark, who lives on a property at Verriedale, sent through a photo of a family of exquisite squirrel gliders that are inhabiting one of his nest boxes. During a routine check of the 10 Land for Wildlife boxes installed on his property, two of them contained families of squirrel gliders. These mammals are always in a family group, with one of the males being a "lookout” in case of danger. He is often called the "sacrificial” male. Rather sad, but I have seen a young male in an aviary situation run out from the nestbox onto a branch and stay there for quite some time when a snake was in a tree nearby. On this inspection of boxes, the squirrel gliders were not too concerned with having the lid slightly opened. Being nocturnal, they are happy to sleep away the day unless there is a major disturbance in their habitat. This box has a camera trained on it, but the nightly foraging is very sporadic. Maybe too much of a routine would make it easier for their predators. One of our newer members recently told us of his monitoring with a little camera, on a flexible cord, that was able to be plugged into his mobile phone and used to observe what was happening in the nest box, with minimum disturbance to the animals inside.